I've been thinking a lot about how I felt about this book. I think the topics it address (depression and suicide) are important. I also think it opens readers eyes to the really terrifying world of suicide. Because of that, I think I had a hard time deciding if the book was worth reading or not. Over all, I closed this book and half hated it, and felt pretty "meh" about it in general. 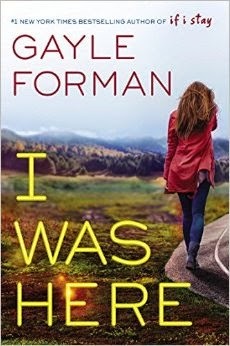 Gayle Forman is a great writer and so there was at least that. I just wasn't feeling the storyline at all. Meg Garcia is an 18 or 19 year old girl from a small town, gone away to Seattle to private college on a full-ride scholarship. She leaves behind her best friend, Cody, even though they had always planned to move to Seattle together because Cody just can't afford it. Then, out of nowhere, everyone close to Meg receives an email from her, a suicide note. And just like that, Meg is gone. Drank poison and died alone in a motel room. But there is something off about her suicide note. Something that only Meg's ten year old brother catches And when he mentions it to Cody, they agree that Meg was hiding something. SomeONE. Someone connected to her suicide. Cody sets off on a personal redemption quest to find out what happened to Meg— because the guilt she feels for not even knowing Meg could do such a thing is crushing her. Slowly, Cody begins to think that despite their closeness and years of friendship, she doesn't really know Meg at all. There was so much mystery in this book. Did Meg kill herself on purpose? Did she die alone? Was she protecting someone? Did someone drive her to it? Was it one of her Seattle friends? Was it that boy, Ben, that she mentioned once or twice? This is the thing that drove me through much of the book. It was compelling me to turn pages. But then Cody finds out exactly how it happened, and her purpose and pursuit lead the book down a different path that becomes less compelling and more iffy. Like, there are only a few ways that Forman could get Cody out of the situation/path she is on and all of them feel like crappy endings. Not to mention there is a romantic side to this book that I honestly felt should have been left out entirely. Also, I understand that the way Cody was raised, her self-esteem, and her total mental exhaustion and anguish over losing her friend drove the way she was acting... but there were times when I was tired of reading about her. This is no "All The Bright Places" type of suicide/depression book. This one is darker, more maddening, leaves with you ugly feelings... You might say it's a little more realistic and terrifying. It wasn't until I read the Acknowledgements in the back, did the story make a little more sense to me. It wasn't entirely a fiction. Forman had heard of a very similar situation to the one she wrote about, and addressed issues of depression as a mental illness and talked about suicide help. Honestly, I felt like the Acknowledgements should have been read first just so it could have made more sense to me. I think this book plays two parts. One is the story of Meg. It's a story about how depression and suicide are real things. But mostly, it's a story about the people left behind. How they cope, how suicide can destroy more than just one life. You decide how you feel about it. I'd say it wasn't an entirely terrible read, but it wasn't spectacular. It isn't one that I'll recommend to people or add to my shelves. Let me know what you think! I recommended Dr. Pepper with this one because whenever it was time for Cody to take a drink, that's what she was drinking.